Excitement is growing in the Team PNG camp as the opening ceremony for the 2017 Pacific Mini Games nears. 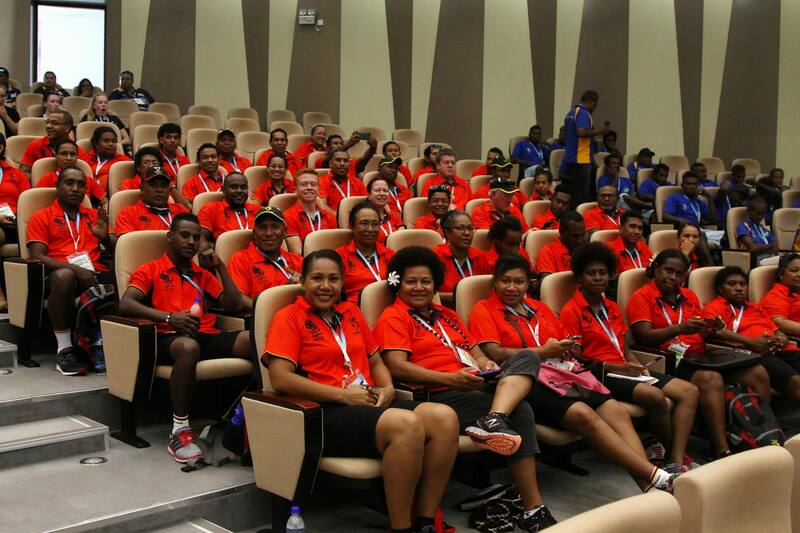 It showed during the flag raising ceremony that was held at the National Convention Centre in Port Vila on Sunday. Team PNG athletes and officials sang the PNG national anthem loud and proud as a way of saying they are ready for the VAN2017 Pacific Mini Games. Chef de Mission, Emma Waiwai, said the feeling in camp is high and positive and it was great to see everyone standing together and singing the national anthem. All 23 countries gathered to witness the ceremony, which featured performances from cultural groups and local artists. Instead of the traditional way of welcoming each country separately, for Van2017, the national anthems for each country were played one after the other with a display of their respective flags. Delegates from each nation, including the Sports Minister for Vanuatu and the Lord Mayor of Port Vila, also attended the ceremony. President of the Pacific Games Council, Vidhya Lakhan, thanked Vanuatu for organising the Games and ensuring that all is ready for the visiting countries. The chairman of the games organising committee for Van2017 welcomed the teams to the Games and thanked everyone who worked hard to prepare the stage for the Games this year.